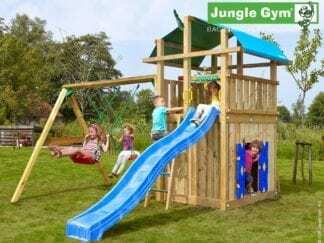 Jungle Gym combination climbing frames offer a little more than the standard climbing frame and slide. 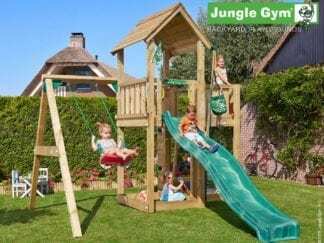 With the fun swing attachments, the climbing frame will become a hubbub of activity at birthday parties, playdates, and on sunny days and cloudy days alike. 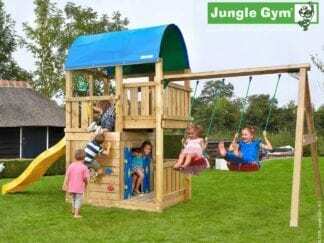 Jungle Gym offer the very best in wooden climbing frames, climbing frames with slides and climbing frames with slides and swings. 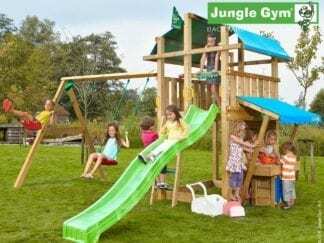 Bizzie Bodies is proud to supply the ever-popular Jungle Gym range. 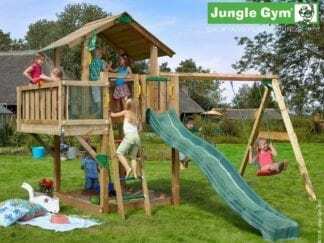 Our combination children’s climbing frames can be delivered to you within 8 -10 days of ordering, with finance packages available. It’s not just swing packages that are available in the combination range. There’s a market stall for shop games where they can grasp the use of money and counting, or you could add a balcony, so there’s room for them all to be king or queen of the castle! A bridge between modules creates a great sense of space for your children to play and express themselves, giving an opportunity to overcome trepidation by trying new things. There are many options and combinations, the only limit is your imagination. As you create a space that is just for the kids, they will relish the opportunity to let off steam and to be as loud and as excitable as they like. Encourage your children to build memories in your garden as they grow and explore together, striding bravely into a new and exciting world with confidence.